Micafluid is a leading developer and high service level provider of insulating oil and gas treatment plants. The company specialises in the degassing, drying and filtration of oil used in power transformers and associated high-voltage (HV) equipment. Micafluid’s range of products consists of oil treatment and regeneration plants, vacuum pump systems, and equipment for servicing and maintenance of sulfur hexafluoride (SF6) gas for switchgear, circuit-breakers, and HV transformers. The typically lengthy and expensive process of transformer oil replacement can be avoided through the use of Micafluid’s oil treatment plants, which save time and money, while guaranteeing the complete recovery of oil properties. With Micafluid’s variable oil purification (VOP) plants, clients do not have to match their transformer to the size of their treatment plant. The company’s VOP product line ranges from a 300L/h throughput to units with a 30,000L/h oil treatment capacity. With Micafluid’s treatment plants, oil flow is automatically adjustable, allowing for easier and more versatile operations. The company’s plants use vacuum and Micropore filtration technology, while all units are PLC-controlled, integrating fully automatic functions that enable the treatment, purification and filtering of oil without de-energising the transformer. 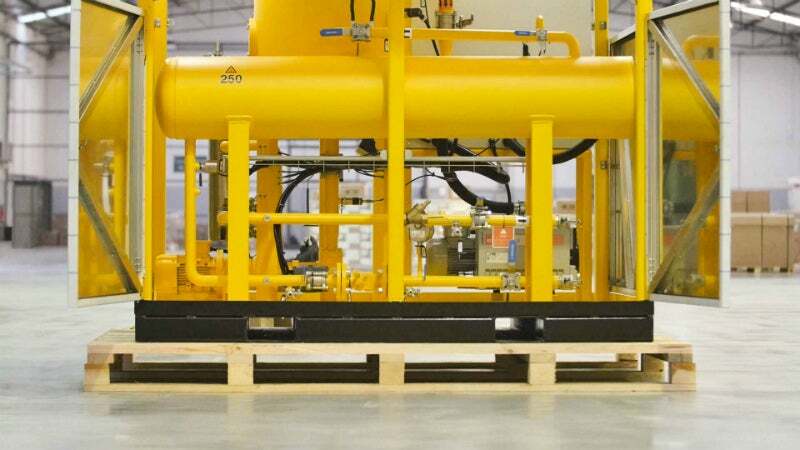 Micafluid’s compact and mobile oil regeneration systems improve the dielectric properties of aged oil, by using Fuller’s Earth technology and vacuum drying, and the units adsorb the carbonyl and hydroxyl components in the oil. The systems consist of one or more adsorption columns, filter housing, and an optional inhibition set, which work together to remove the acidity and moisture from the oil. This process dramatically reduces long-term risks, while improving the oil’s dissipation factor, and refining its colour. Micafluid’s regeneration units can be connected with separate drying and degassing oil treatment VOP plants. Micafluid has a more than 40 years’ experience in handling and treating gas-insulated power equipment. SF6 is a heavy gas commonly used in metal-enclosed switchgears, HV circuit breakers and transformers, linear accelerators, capacitors, and gas-insulated power lines worldwide. The company’s compact mobile units are fitted with all the required features to ensure safe, dependable and environmentally friendly treatment of SF6 gas. Designed and built in Switzerland using state-of-the-art, heavy-duty European components, Micafluid’s gas treatment and recovery units (GTRU) recover, purify and refill SF6 gas, while offering a high degree of versatility through automated drive and control technology. Micafluid’s GTRUs offer the optional ability of recovering and refilling one gas chamber, while simultaneously emptying another compartment as an additional benefit. Standard units are available with internal tank sizes of 30L, 330L and 630L. Micafluid supplies many accessories such as gas transfer hoses, valves, filters, and adapters. These can be used with the GTRU units, in addition to the required equipment for measurement and monitoring of SF6 gas quality such as digital pressure and vacuum gauges. They can also be used with regulators for the reduction of gas pressure. The tools allow continued surveillance, which is essential for the longevity and sustained optimal operation of all gas-insulated electrical components. All units requiring maintenance are repaired and tested by Micafluid’s service specialists. A detailed service protocol will indicate the state of the unit on arrival, the work and testing needed, as well as guaranteed future performance after servicing. Personnel training and commissioning of the systems can be conducted at the client’s facilities or on-site. Micafluid’s process engineers make use of the best practices to train operators regarding the use of the plant’s process control, operation and maintenance features. By subscribing to Micafluid’s Machine Virtual Assistance (MVA) Support Platform, users have instant remote access to their machine. The company’s MVA system quickly enables organisations to remotely view and act on the oil treatment operation, reducing transport and operator costs. A central database organises processes for future reference and makes traceability, comparison, and reporting easier and more efficient. The MVA Support Platform also includes an option for a remote alarm system via SMS. Micafluid is the sole beneficiary of a century-old heritage, which has built an extensive wealth of knowledge and experience in the power industry. Founded in 2005, the company’s strong expertise makes it the ideal partner for energy operators, as it not only cares about equipment, but helps dedicated businesses worldwide save money and time. The company’s research and development team is committed to transformer plant maintenance through the removal of water, gas and sediment contents. The team also work to preventively preserve equipment’s original insulating performance according to the latest industrial standards and protocols. Micafluid is attending the Coiltech International Coil Winding Expo and Conference, which is due to take place on 26-27 September in Pordenone, Italy. Micafluid’s Swiss technology used for the conditioning and purification of insulating oil has been widely used globally over the past century since 1913 and has offered excellent service and results for its respective customers. Micafluid’s vacuum pump system type “VPU”, with an automatically controlled suction capacity of roots pump, is designed for economical and independent on-site degassing and dehydration of transformers under vacuum. We pride ourselves on our engineering know-how and experience that provides us with the proprietary skills needed to design and execute both simple and complex projects with the expected Swiss ingenuity and quality. With Micafluid’s variable oil treatment plants, you don’t have to match the size of your treatment plant to the size of your transformer. During training and commissioning, Micafluid AG process engineers perform training for the operators at our workshop in Schlieren, Switzerland. Using entirely dry-running compressors and vacuum pumps, our gas treatment and recovery units are built at our manufacturing site in Switzerland using state of the art, heavy-duty Swiss and European components. Micafluid provides fine filters and spares for Micafluid and MICAFIL oil treatment plants that have an optimised graded density with fine pore sizes in inner layers and bigger pore sizes in the outer layers for high removal efficiency, high dirt holding capacity and long service life. Micafluid is at the CWIEME BERLIN exhibition, which is taking place from 19-21 June at Messe Berlin, Germany.